Continuing the discussion of military surplus trucks started with this post about the CUCV, here is my favorite US military surplus truck. The engine is its only weak point; it is torquey but has reliability issues. The rest of the truck is extremely solid, and lots of people have simply dropped in a small-block Chevy V8, solving that problem. That is a good swap, but personally I think a Chevy 292 or a Ford 300 would be a better swap. Both are rugged, torquey inline six cylinders with gear-drive cams. The AMC 232 or 258 six cylinder would be another good choice. They have a timing chain, but it is short and not prone to problems, and that engine's 7 main bearing design is legendary for its reliability and longevity. The 4.0 liter inline six that Jeep used through 2006 is an offshoot of this engine. One company used to produce an engine swap kit for these trucks that included a new Hercules inline 4 cylinder turbo diesel engine; a gear change to 4.09:1 was recommended to bring the rpm down to a level more agreeable to the diesel engine. These trucks came with 35 inch tall tires, so 4.09s actually work well on the highway. 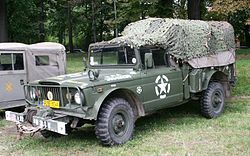 The Kaiser Jeep M715 is an American wheeled military vehicle based upon the civilian Jeep Gladiator. In 1965 the design and developing for the M715 began. This was the U.S. Government's first attempt to try a commercial off the shelf truck to be used in a military capacity. The U.S. Government purchased these trucks to replace the M37. Between 1967 and 1969 over 33,000 trucks were produced at the Toledo, Ohio plant. The M715 was considered by the U.S. Government to be underpowered compared to the M37 it replaced. Kia is currently designing an M715-type vehicle named the KM450 for the South Korean Army on license from the U.S. Government. India's Tatra/Vectra is also entering an M715 type vehicle as a candidate for the Indian Army's LSV requirement. The Kaiser provides a couple of wheeled vehicle configurations. These are cargo/troop carrier, ambulances. Engine: Inline 6-cyl, 230.5ci overhead camshaft "Tornado"
The Kaiser Jeep M715 is called a 1¼ ton, or Five quarter ton truck. It was built for the U.S. military based on the civilian Jeep Gladiator. The M715 family saw service in Vietnam. The M715 family was produced from 1967 through 1969. This page was last modified on 17 October 2008, at 23:16. The one I lusted after was the ambulance built on a Power Wagon in the sixties. I figured with a little work it would make a nice camper that would go way back into the boonies. Yeah, I like the ambulances too; both the WWII version and the later M43 (ambulance version of the M37), as well as the M725, which is the Jeep ambulance based on the M715. It would indeed make a nice camper. I can imagine deer hunting for several days out of something like that. It would be tempting to put some kind of military tent heater/stove in the back, either one of the woodburning variety, or perhaps the one that burns gasoline or diesel fuel.